Women’s fashions changed constantly during the 19th century. During the early years of the century, hoop crinolines were popular: these were large, wired bellshaped structures that fitted beneath a skirt and gave it a very full appearance. By the mid-1800s, bustles had taken over in popularity. These skirts were straighter but had large gathered sections of fabric over a framework worn at the back. At the same time, undergarments such as corsets were worn by women of all classes to create smaller waists and bountiful curves at the bust and bottom. 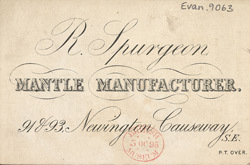 Manufacturers such as Spurgeon had to ensure that they were abreast of the changing fashions.